Today, is Safer Internet Day. 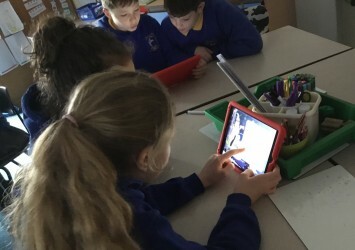 We believe ever day should be a safe day to use the internet and are always reminding the children about appropriate behaviours; about internet and website contents and about the dangers of being online. Each class was asked to choose a focus for Safer Internet Day that may be specific to their year groups. The Excellent Eagles have been learning about safe use of the internet and information sharing. This has included learning about what information to give out and to whom. They worked through a series of tasks including watching this video https://www.youtube.com/watch?v=599I1E-rWTU and using an online pirate game about giving information. We also discussed the use of free apps and how they often take information but feel 'less risky' but can often have hiddden dangers. We had good discussions about our own online experiences - good and bad - and decided we should go home and check our privacy settings. We know discussing online activity with our parents is vital and have recognised that sometimes our safety is at risk. We will continue to remind, check and discuss social media - it’s benefits and dangers - throughout the year.